In particular they identify two competing systems, the Scan Eagle from Insitu and Textron Systems Aerosonde sUAS. We have been talking about the Scan Eagle for almost seven years. Also the Coast Guard has been using Scan Eagle operationally, but since we have not talked about the Aerosonde I thought, perhaps we should take a look. There is a pdf brochure on the Aerosonde here. 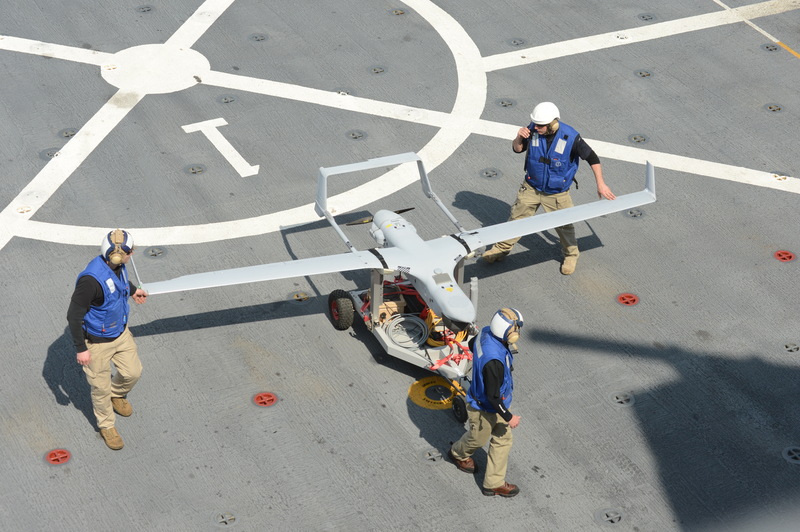 The Aerosonde is a bit bigger than the Scan Eagle, but if a larger aircraft is needed then Insitu has the option of offering the RQ-21 Blackjack which is in the Navy’s inventory. For a rough comparison, Scan Eagle has a max Take Off Weight 44-48.5 lb. (22 kg), Aerosonde has a max TO weight of 80 lb (36.4 kg), and the RQ-21A Blackjack a max TO weight of 135 lb (61.4 kg). “The U.S. Coast Guard customer has expressed unique technology and operational requirements in its Small Unmanned Aircraft Systems (SUAS) RfP,” so we are not simply going to buy what the Navy already has. Using the usual optical systems is like looking through a straw. I expect the Coast Guard is going to want an area search capability, radar or perhaps ViDAR. Figuring out how best to use these is going to be an interesting Operations Research problem. What search pattern? at what altitude? How far out can we fly these and still communicate and have the cutter provide sense and avoid to prevent a mid-air? This entry was posted in UAS, UAV and tagged FRP, request for proposal, sUAS by Chuck Hill. Bookmark the permalink. Leonardo MW AN/ZPY-8 “Osprey” MM SWaP (low Size, Weight and Power) Second Generation AESA (Active Electronically Scanned Radar) for use on Northrop-Grumman MQ-8C “FireScout”. A Bolt-On Application Pulse Phased Array, with a 240* FoV out-to ~200nmi for Aircraft and ~150nmi for Missiles. System weighs ~64-pounds. That is still big for the small UAVs. Plus there is the question of power requirement. The largest of these, the RQ-21 has a max payload weight of 39 pounds and a maximum power available of 350 watts and certainly they are still going to want optics included. Someday we may have the MQ-8C but the systems they are contracting for now are much smaller. Any thoughts on what a EO/IR sensor plus necessary comms at max. 39 pounds payload capable of in ability to track targets, ships and sea skimming missiles. Would 50 nm range be possible, approx. 3 times of ships surface radar horizon, if circling ship, from necessary limited height if the UAV was maximising sensor payload. @Leveller, On the other hand, the AN/ZPY-8 “Osprey” could make a very good radar for our helicopters.